First, there is sweetness in his eyes and voice; the kind of sweetness combined with firmness as a result of burden and hardship. 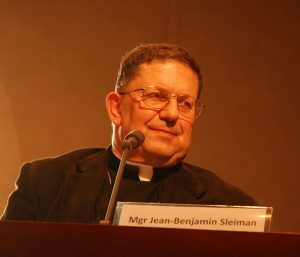 Jean-Benjamin Sleiman is a Latin archbishop who has been residing in Bagdad for 9 years. He holds a PhD in social and cultural anthropology, is a religious of The Order of The Discalced Carmelites and was adviser to the General Superior of his Order in Rome for ten years. Originally Lebanese, he had witnessed up close the ousting of Saddam Hussein and the horrors of war and embargo. He shared the situation of Iraq’s Christians tempted to flee their country. He prayed and cried with families whose sons and daughters were persecuted. He saw them become “willing victims” which made them second-class citizens. He is seeing them today being assassinated without any State protection. Even though he admits he was scared to talk sometimes, the archbishop of Bagdad continues to strengthen his brothers with words full of love and honesty: “Christians in the Orient must know that they are actors and witnesses of peace, bearers of humanity and revealers of their societies’ ideals and their true yeast.” It is a powerful and relentless appeal to all of us, Christians, to have faith and courage.